Royal Doulton Pallas Quality Product. Two tap hole. 2TH. Made In The U.K. Approximately 500 x 450mm. Made from acrylic with fiberglass reinforcement. Discontinued vanity cupboard tops, bowls and basins. Drop in to worktop or sit on top of unit. JSL Bathroom Suites. Bradford. West Yorkshire. Specialists in rare and obsolete colour products. Beige Marble. 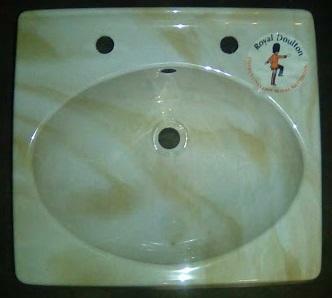 500 x 450mm vanity basin top bowl. Made from acrylic by royal doulton. Yellowy Beige Creamy Hue. Pallas Model. Made from acrylic with fiberglass reinforcement. Drop In To Worktop or Sit On Unit. Onyx and marble coloured acrylic vanity basin top bowls may be inset to a worktop or sit directly onto an appropriate cupboard unit. The colour will vary Slightly from the picture due to lighting and colour correction settings on both the camera that the photograph was taken on and the monitor that you are currently viewing the image on. These vanity bowls are made in the united kingdom by Royal Doulton Bathrooms. JSL Bathroom Suites. Bradford. West Yorkshire. Specialists in rare and discontinued Bathroom Products and Parts.